Did you know there are 101 species of mammals found in and around the British Isles? 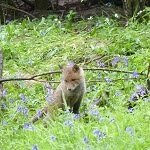 The Mammal Society have more information about mammals across the UK. Twenty-three of our native terrestrial mammal species are resident in Sussex along with eighteen species of bats, a number of introduced or naturalised species, and marine mammals. Find more information about the wetland mammals found in Sussex on the Sussex Wildlife Trust website. So what are our mammal species (and our mammal surveyors!) up to at the moment? If you are lucky you may see brown hares boxing on the South Downs this spring - this is often a female responding to unwanted attention from a male! Young weasels are born in late spring, and will be ferocious hunters by the middle of summer. As the temperature increases we can start to monitor populations of voles, mice and shrews using live traps. Inkpads at the ready! This is a great time to survey for hedgehogs using a footprint-tunnel. Monitoring surveys are underway across Sussex for the hazel dormouse. Down by the water? Remember to look out for signs of water voles including latrines, feeding signs and burrows. As the hazelnuts begin to fall - it's time to check whether they have been nibbled by the hazel dormouse. When vegetation dies down in late autumn take your opportunity to look for harvest mouse nests - these tiny balls of woven grass are a great way to record this species. Keep an eye out for owl pellets - these are a useful source of records of mice and voles. Most badger cubs are born in January and February - don't expect to see them just yet though; they won't usually leave the sett until the spring. Bats, hedgehogs and hazel dormice are safely hibernating as a way of saving energy while food is scarce during the winter. Screams in the night? It's the fox breeding season!